“Frankly my dear, I don’t give a damn” is one of the most memorable lines in movie history. The “vulgar language” must have been shocking to a 1939 audience but certainly doesn’t reflect my feeling toward the movie. Gone With the Wind could easily be compared to this generation’s Titanic (1997). Both films were wildly popular and based on historical events woven with a myriad of characters and a doomed love story. Fortunately, Rhett Butler leaves for a new life in Charleston instead of drowning. 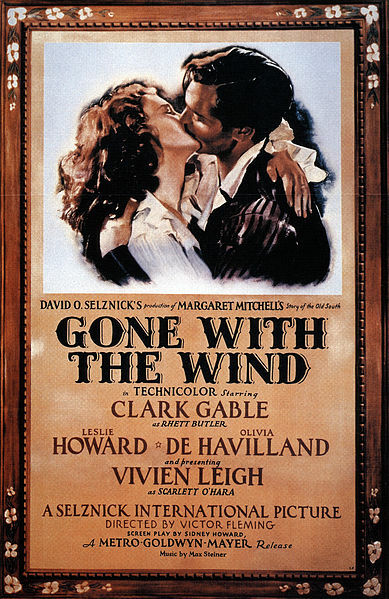 Gone With the Wind may also be the film from the 1930’s that is most familiar to today’s movie goers. Of course, being our first Academy award winning film in Technicolor makes it much more accessible to audiences of today who view films in black and white with distain (I feel sorry for them as they don’t know the great movies they are bypassing – hopefully our blog has peaked their interest). Although not a definitive popularity measure, it is interesting that the well known Oscar winning film You Can’t Take It With You has slightly over 10,000 user reviews on IMDB, It Happened One Night and All Quiet On The Western Front have approximately 30,000 user reviews each but Gone With The Wind exceeds 110,000 user reviews (262,000 reviews on Rotten Tomatoes) – wow! This film is truly epic both in its length (238 minutes) and grandeur. Not only does it introduce color cinema, it utilizes the medium to its full capacity. In fact, William Cameron Menzies won an honorary Academy Award for outstanding achievement in the use of color for the enhancement of dramatic mood. The scenes of the Atlanta burning are awesome, and the scenes in the Civil War make-shift hospital are appropriately poignant. I’m sure the plantation panoramas and the magnificent shots of Scarlett silhouetted against the evening sky delighted the viewers of 1939 as much as it did me. In addition to the film’s technical achievements, we are presented with a story of soap opera proportions based on Margaret Mitchell’s novel bolstered by a blockbuster cast of Hollywood’s finest. This film won 8 Academy Awards and was nominated for 5 others. With 13 nominations, this film became the most nominated and victorious film in the Academy’s early history. Vivien Leigh, the Best Actress winner, delivers a memorable portrayal as Scarlett O’Hara. Of course, when an actor’s dialogue comes from Sidney Howard’s Best Writing Screenplay melded with Victor Fleming’s Best Directing, the results should be stellar. My favorite award winning performance came from Hattie McDaniel, the first African American to be nominated and win an Oscar. Her portrayal of Mammy, the house servant, won her Best Actress in a Supporting Role. The emotion she evokes from her character is inspiring. This is our third Clark Gable movie and the Hollywood idol provides a solid performance as Rhett Butler. Although he didn’t capture the Best Actor award, many 21st century movie viewers have difficulty distinguishing Clark Gable from Rhett Butler. Olivia de Havilland played the memorable milk toast Melanie Hamilton but lost as Best Actress in a Supporting Role to fellow cast member Hattie McDaniel. Leslie Howard plays Ashley Wilkes, Melanie’s husband and Scarlett’s unrequited love interest. How can I write my impressions of Gone With The Wind without mentioning Butterfly McQueen’s Prissy who famously states “Oh, Miss Scarlett, I don’t know nuthin’ ’bout birthin’ babies” whereby Scarlett slaps her across the face. In fact, over almost four hours, Scarlett seems to slap a lot of people in the face. Finally, I would be remiss not to comment on Max Steiner’s original musical score. The haunting melody draws you into the movie and one need only hear the first few bars of the score to immediately recognize it. Naturally, I had seen Gone With The Wind previously but this is the first time I’ve viewed it within the context of our journey through film history. I have a much greater appreciation for its groundbreaking achievements and its importance in the pantheon of film making history. As we enter the films of the 1940’s, I am anxious to see the continued evolution. The production of this film has several particular aspects that set it apart from previous Best Picture winners, particularly the fact that this film was in color. The process of Technicolor added an even more epic quality to the highest grossing film in history in terms of inflation adjusted dollars. While James Cameron may try and dispute this fact, the staggering 196 million tickets sold for Gone with the Wind is unrivaled. That figure does include re-releases, which at least was not as profit-mongering as James Cameron and George Lucas’ re-releases of their classics in 3D. Rather than being redundant, I’ll wait till 1997’s review before panning Titanic’s re-release. I also want to point out one additional item of note before actually beginning this review; director Victor Fleming had perhaps the biggest one-two punch in cinematic history in 1939. On top of Gone with the Wind, Fleming also directed the other Technicolor titan of 1939, The Wizard of Oz. It would also be impossible to discuss Gone with the Wind without mentioning the stellar performance of Clark Gable as Rhett Butler. This is Gable’s third appearance in a best picture winner, and his portrayal of Rhett Butler is his most iconic role in his filmography despite the Best Actor snub. I could spend the review recounting endless Rhett Butler one-liners, but that feels a little bit contrite. Let me instead grace this review with some stray observations and thoughts, and one overarching imperative statement: See this film. I understand the time commitment it requires, but it is an important foundation of any film aficionado’s lexicon and a true masterpiece of early Hollywood. This film is about land both metaphorically and literally, and in particular the land of the past. Gerald O’Hara (Thomas Mitchell) starts the film by describing to Scarlett that the only thing that matters is Tara. Tara is the name of the O’Hara’s plantation, but it is also Latin for Earth. While the Latin is spelled a little bit differently, Terra, this is clearly a metaphor from the Margaret Mitchell story that has a deeper significance than merely the O’Hara’s plantation. After all, the Civil War was fought over state’s rights and what power a federal governing body should have over an individual’s property. Do not read that statement as a belittling of human rights and the slavery issue, which was also an instrumental issue in the secession of the Southern states. This value of property and land was a continuance of a tradition that had lost traction in the progression of society, and the South vehemently wished to protect their neo-aristocracy. Rhett Butler describes the issues with waging war with the North in his sentiment that “all we [the South] have is cotton and slaves and arrogance.” This statement represents a clear foreshadowing of the impending disaster that will accompany the ill-fated war for independence. This film is an effective melodrama and emotionally manipulative tragedy. Given the amount of character development in the film, it is hard to watch awful things happen to the characters that we have become so attached to. In particular the fates of Bonnie Blue Butler and Melanie Hamilton cut the audience to the bone. Some of the special effects, like Gerald’s riding accident, are a tad dated, however the magnificent cinematography highlighted by the piercing red background allow us to forgive these insignificant miscues. Honestly, some of the freeze frames of this film could easily be paintings, especially the beautifully depicted silhouette of Rhett and Scarlett against the backdrop of a burning Atlanta. One of the most noticeable uses of a crane shot in our films thus far, also provides a jarring display of the magnitude of the wounded soldiers littering the streets in the aftermath of the Battle of Atlanta. While I will try and not rant on this issue, I want to let it be known that I don’t like Ashley Wilkes, and don’t understand his appeal to Scarlett. I understand he is the man that she wants because she cannot have him, but how could you ever possibly shun Clark Gable for such a weak-willed man. Also, I know that this takes place in the Antebellum South/ Civil War Era/ Reconstruction-era but Ashley and Melanie are cousins and that will always weird me out. I know it’s a family tradition and an effort to keep Twelve Oaks in the Wilkes family tree, but that family tree is going to have a lot of genetic problems at this rate. I understand that Ashley is important to the tragic plotline and I’m not recommending for his role in Scarlett’s life to be changed, but I will never enjoy watching Ashley’s storyline. There is a perfect sense of irony when Scarlett is relegated to the duty of midwife to help birth Ashley and Melanie’s child, especially with the burning of Atlanta in the background. Ashley is a good vehicle for showing the development of Scarlett from a self-indulgent Southern belle at a barbeque at Twelve Oaks, to a strong independent woman. Scarlett is without a doubt the strongest female role that we have seen thus far in our film journey, and her transformation from helplessness to murderer is quite the paradigm shift. Lastly, I cannot talk about Gone with the Wind without mentioning the issues I have with race portrayal in this film. While I can try and pretend that the film’s portrayal of Blacks is merely dated, the social activist in me wants to scream out for justice. This film was made before the Civil Rights movement and I feel as though Hollywood has shown a historical tendency to make caricatures of black culture and speech patterns. Honestly, I feel as though that tendency still exists in today’s film going experience but in a different format (Tyler Perry I’m looking at you), but that is a different rant. The role of Mammy (Hattie McDaniel) at least provided characterization and dimension for a change, compared to previous portrayals of black servants with no inkling of depth. I am very proud of the Academy for giving Hattie McDaniel the Oscar for Best Supporting Actress, because she delivered her performance with such power and grace that she demanded her accolades. Hattie was also the first black person to ever win an Academy Award, so she is certainly a trailblazer in the white-dominated Hollywood world. However, not all parts of the country were as accepting of McDaniel’s race as Hollywood. The Fox Theater in Atlanta refused to allow her to attend the premiere of the film because it was a White’s only theater, a fact that will always be a blemish on that fantastic venue. The portrayal of Prissy (Butterfly McQueen) was not as forgiving as that of Mammy, and has very patronizing emphasis on her high-pitched voice and child-like timidity. While there are clear issues with this film in regards to race, however from a filmmaking and historical standpoint this film is classic in every sense of the word. I conclude with a reprise of an aforementioned imperative statement: See this film.